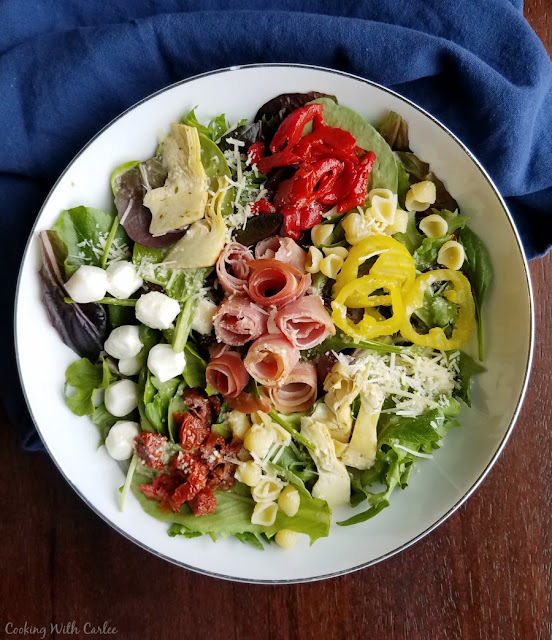 All of the goodness of an antipasto spread on a perfectly flavorful salad. 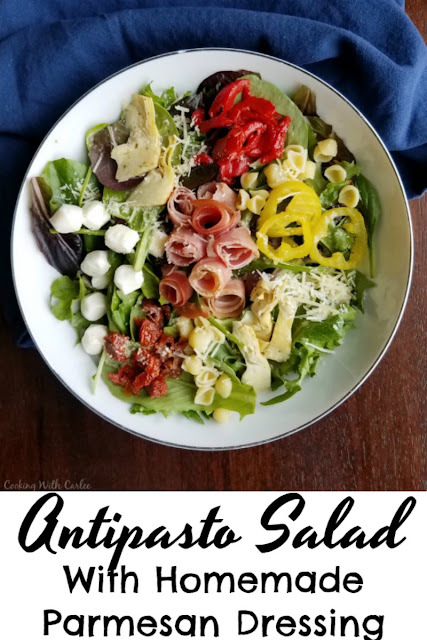 A drizzle of our favorite Parmesan salad dressing helps make this a great brunch, lunch or salad course to start and amazing meal! Make salads fun again! With the weather finally warming up, my thoughts have turned to salads. Despite the bad wrap, salads can actually be amazing. They do not have to be boring or rabbit food, not one little bit! Pack them full of great flavors and textures and you can have something they rave about, even those salad haters! 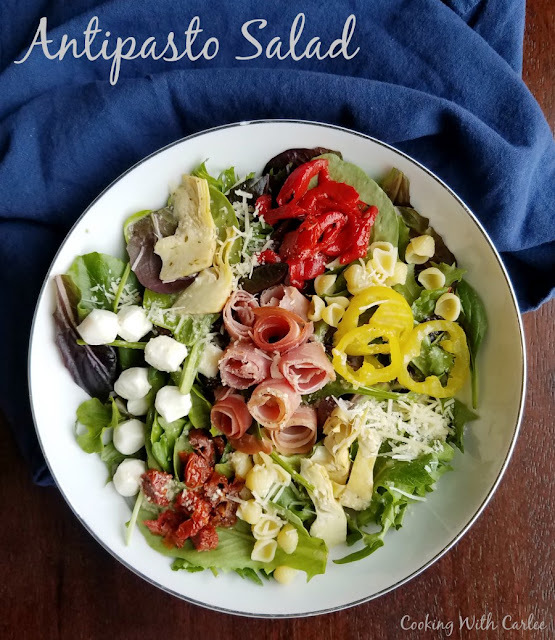 This antipasto salad is just that, loaded with great Italian inspired flavors and drizzled with our favorite homemade salad dressing. 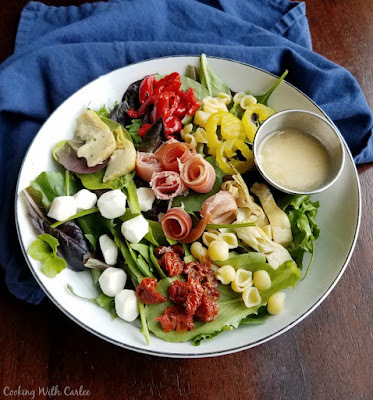 When the box from Cento Fine Foods arrived with roasted peppers, marinated artichoke hearts, sun-dried tomatoes and capers, my thought instantly went to a beautiful salad. I just knew a nice bed of greens, a little prosciutto and some cheese would make for an excellent salad. Besides, it had been a while since I made my great-aunt Ellen's Parmesan salad dressing and I had a hankering. I just knew it would be perfect over this Italian inspired beauty. I hate to say it, but I was totally right! A salad like this is a thing of beauty. My husband was pretty pleased when I set one in front of him. He is usually a meat and potatoes kind of guy, but this one even had him awestruck. He said it was something that if you ordered it at a restaurant, you'd be pretty pleased when it came out. Now I am not sure I've ever seen him order a salad at a restaurant, but I will take the compliment anyway! Of course I think this would make a great savory option on a brunch lineup. You could make one big salad and serve a bit to each person or make smaller versions if you are having a spread. This salad would also make a perfect lunch, light dinner or starter for an out of this world Italian feast. The possibilities are endless! Cut vegetables into small bite sized strips. Roll the prosciutto up longways and slice into small prosciutto rosettes. Place an handful or two of greens on each plate. Arrange veggies, prosciutto and cheese over top. Drizzle with dressing or serve on the side. What a beautiful salad!! 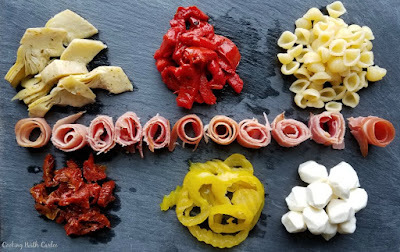 Gorgeous and I know brimming with the yummy antipasto flavor. I cannot wait to get the ingredients for this! Great minds think alike. I had considered making something similar this week. This used to be my go-to lunch when I was doing my masters course work. So good! It was soooo good. I can see why it was a staple! Hi Carlee, your salad is so pretty!I would never have thought to serve a salad like that. I do add alsorts of ingredients, but usually toss it all together. I will be giving this style a try for sure. I am loving these Cento products. Your salad looks amazing. Anyone would be proud to serve up this beautiful dish. I am loving them too! Thank you! That is one beautiful salad!! It looks like a great lunch. Thanks for sharing at the What's for Dinner Party! What a perfect spring / summer dinner ! I could do this all the time! 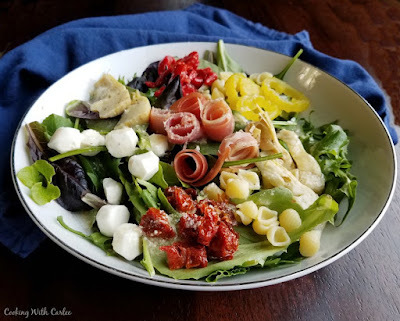 Perfect for our Spring Salad Link Up @ Celebrate365! Me too, especially when it's this hot out! This salad looks so good and so pretty too. Come on in salad season!! !